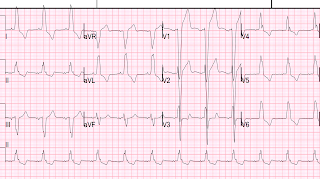 There is sinus tach with left bundle branch block (LBBB). 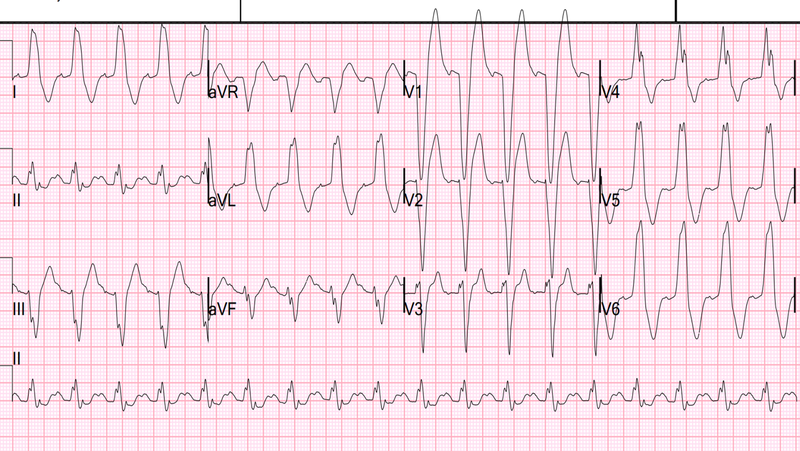 There is excessively discordant ST elevation in leads V1 and V2. The highest ST/S ratio is in V1, with a ratio of 8/30 = 0.27, highly suggestive of LAD occlusion. In our study of coronary occlusion in LBBB, we excluded patients with severe hypertension, extreme tachycardia, respiratory failure and pulmonary edema for 2 reasons: 1) they often have false positive ECGs and 2) they need critical care in any case, with or without angiography. So, although this patient has excessive discordance, it is not necessarily due to coronary occlusion. In this case, the very high voltage suggests LVH, as does excessively discordant ST elevation confined to leads V1 and V2. After intubation, the BP was 120/70, there was a combined respiratory and metabolic acidosis, and further exam revealed absence of peripheral edema. The patient was put on a nitro drip. A bedside echo showed probable anterior, apical, and septal wall motion abnormality, but this is very difficult to interpret by the non-expert because of the dyssynchrony caused by the abnormal activation sequence in BBB. The patient was regaining hemodynamic stability and a repeat ECG after supportive care (cannot be found) showed much less ST elevation. Now the highest ST/S ratio is still in V1, but is 4/35 = 0.11. 0.11 is the normal mean maximum ST/S ratio for leads V1-V4 in our control group. So this discordant STE is now entirely normal. At cath, there was a low left ventricular end diastolic pressure (LVEDP) at only 6 mmHg, indicating that whatever insult caused the pulmonary edema has rapidly resolved. Then the pulmonary edema also rapidly resolved. Subsequent formal echo showed concentric LVH, questionable anterolateral and inferior wall motion abnormalities, dyssynchrony from BBB, and EF of 37%. The patient did very well and was extubated the next day. Was the excessive discordance on the ECG due to physiological stress of respiratory failure, pulmonary edema, tachycardia, and hypoxia (severe demand ischemia), or was there another inciting factor? It might be better to ask: what initiated the pulmonary edema? 1) Was it fluid overload leading to pulmonary edema, then a worsening cycle of fluid retention, catecholamines, and vasoconstriction? Unlikely because of the absence of edema and the low LVEDP. LVEDP caused by fluid overload does not resolve rapidly. 2) Was it transient ACS with transient ischemia, resulting in poor LV function, then temporarily high LVEDP, then pulmonary edema., then spontaneous lysis of thrombus with resolution and negative cath due to lysis of thrombus? --Possibly. 3) Or was there a transient dysrhythmia (never recorded) that resulted in poor stroke volume, temporarily high LVEDP, onset of pulmonary edema, then resolution of dysrhythmia, then resolution of pulmonary edema? The answer is uncertain. 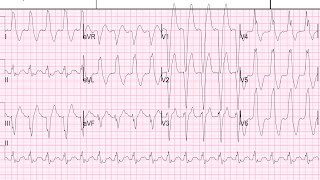 However, the fact that the ECG shows acute current of injury in this case does not necessarily mean coronary occlusion, though transient occlusion or obstruction remains a possibility. 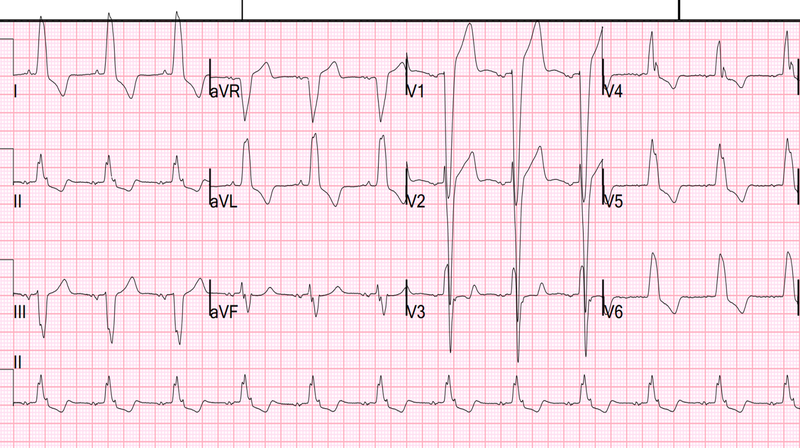 Severe demand ischemia can also cause ST elevation. See this case. Pierre, that might be true, but we studied whether convexity (which would increase the area under the curve) correlated with occlusion and it did not. We did not look specifically at AUC, which takes into account BOTH convexity and voltage, and may indeed work. Nevertheless, we had incredibly high sensitivity and specificity just using the voltage ratio.